A little something I worked up on my MBP while waiting for "Heliocentric (Night)" to render on my main box over the weekend. Once it finished I applied the finishing touches on Bucephalus. I didn't notice while I was making it but my son Ian (upon seeing this render for the first time) mentioned that it looked like it was from the movie "Tron" we had just watched for our Friday Family movie night. I had to agree that he was right. This is my first "mandala" since 2008. I know at the time it was suggested that I do something different with the theme next time, so I hope this qualifies! Nuff said in the title. Keep up the great work. I literally saw this on someone elses' screen on youtube and instantly had to find it. This is amazing work. When I saw the small sample image of this when scrolling through your collection (It's been a while since I've been on here) I thought that it was a wall angled slightly from the left with a wormhole sucking through it. I didn't quite understand the title until I opened it up and saw the full image. While not a bad design, I was a little dissapointed when it wasn't what I was expecting. The 4800x1200 split files archive seems to be corrupt. Only downloads 4kb of data. I really gravitate towards the works you make that are like this - the geometric block-style shapes/theme gets me every time and has been a source of inspiration for some of the RPG stories I write up for my local games. I have always wondered how you modeled scenes like this until I started learning lightwave. I usually use 3ds max for modeling, but lightwave has so many more options and capabilities it makes max seem bland. Interesting how the cheaper software in this case is better than the spendier one. This is a great wallpaper!! 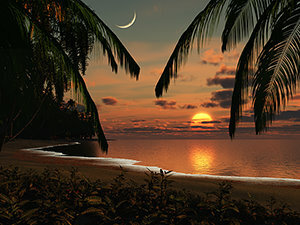 This is my favorite wall paper you have posted in the 4 years I have been subscribed to this site!! GREAT WORK!! This one is just too beautiful. I love the glowing blue colors, the rays of light, the small details and the perspective of the center rings spiraling forward. The fact that it was inspired by TRON makes me even more happy. This is now my favorite! I still like Tropic of Thetis (Nightfall) as well. Looks AMAZING across all 3 screens! :) Thanks! Youre the BEST! Ryan, I don't know what it is, but the last couple of years you have just turned out some phenomenal work... I can't get over it. I think this is the single best multi-screen work you've ever done. I just recently started using two monitors at work, and I think this is the first wallpaper I've found for them that actually looks like it was designed for two screens. I LOVE the right side of this image on the dual-screen version. The single-screen version almost looks cropped by comparison. This is amazing. I've rendered "Clockwork" at 6552 x 4096 and uploaded it to Zazzle for print. It is available at the "Colossal" (78" x 49") size on down to 16" x 10" for anyone interested. Yes! I am planning on uploading them in the very near future. I hope to have lossless versions available shortly for the 7680 x 1600, 7680 x 1440, 5120 x 1600 and 5120 x 1440 resolutions. I already asked this on heliocentric, but I guess I was too late posting for it to be noticed. Any chance there will be lossless multiscreen versions available? Speaking of clocks: I looked at this again, and was reminded of the Watchmen movie--the clock ship that Dr. Manhattan creates, and uses to take Silk Spectre on a sightseeing tour of Mars. I do know about the "clock" at the heart of every computer system, but computers is not the first thing that comes to mind when I hear "Clockwork". I don't really think of it as something specific to computer systems (although nowadays most "clocks" are somehow linked to computers...). And I really liked that YouTube video of the multi-monitor wallpapers. I only have one monitor, but seeing the video sure makes me wish I had more! Your wallpapers look so much more awesome across three screens! I think this is amazing ryan, 10/10 all the way. I would love to see some color variations as well, maybe a black and yellow or red version. Wonderful job ! I love it! Your abstracts always move me. Your genius with your art makes my heart sing! Seriously! BTW: Any news on the multiscreens of Enshrouded? I can't wait!! "@David (re: 5120 x 1600 file)"
I was going to say, "my heart _literally_ leapt" at the sight of this new abstract, but it was more figurative than literal. So, my heart "figuratively" leapt at the sight of a new abstract, and this abstract is quite amazing in its coloring and focus. This instantly earned the desktop position and I can't imagine what is going to trump it (consider the gauntlet thrown down)! Once again, incredible work! Yeah, it's definitely something out of Tron...one of my faves! In addition to Tron, I see a bit of Axiomatic, Color Wheel, and especially Orthohedron in this. Nice addition to your collection of abstracts. There is actually a "clock" (of a sort) at the heart of every computer system. I am always blown away by your work, most especially the mechanical, tech-y, abstracts. Awesome! @Randy: Nice movie reference...not sure that it would be good for a "family night" though. Although, I do think this one is cool; other colors would be nice for the pickel jar versions... purple perhaps? Too much blue. Though I'm tempted to ask for an "orange" version. Abstracts and planetscapes are my favorite work of yours. The scenery stuff is great but I see an obvious niche here Mr. Bliss. Can't wait to see the polished version! I rather like this image. It bring to mind a description of the interior of the spaceship from Arthur C Clarke's "Rendevous with Rama". The very mechanical nature of the image also leads me to think of pictures I have seen of the detector chamber from the Large Hadron Collider. Just visually stunning. I like this abstract so much I am changing it on every display that I can get my hands on it. This is a beautiful render. Awesome vision. You need to run with this. I figured we had to watch the original Tron first. I wish I had a blu-ray though, because my DVD (from way back) wasn't the best quality. All the more reason I think my boys will be blown away by Tron: Legacy. I know I enjoyed it quite a bit (on an eye candy level) when I saw it in the theater. My family and I just watched Tron: Legacy a few weeks ago. 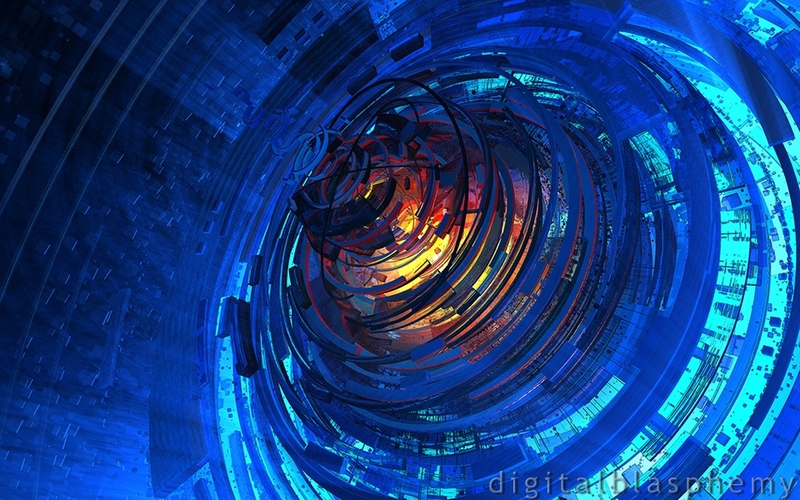 :) Awesome abstract here, I really like the flow of the blue around the center. Greetings Programs! It was indeed the original "Tron". Figured we should watch it before the new one. I really like this abstract. I don't have any criticism for it. As far as what it reminds me of, It looks to me like the reactor core of the Death Star in Return of the Jedi. Actually, Karl gave us a great idea Ryan, you should try a Tron Legacy style. That would be something to see. ;) I like this one though, very good render. The Time Traveler? Lol, i dunno. I like it though. I'm guessing the movie might be Tron Legacy, although the image reminds me more of the video game Tron 2.0. Clockwork really fits in to the style of the Tron universe.